A typical good day for Marianne begins with mediation and matte, meeting with her business partners to discuss ideas and strategy. Afterward, she’ll exercise or watch the pacific sunset on the beach, cook a good meal, paint or dig for music. When she isn’t doing any of those things, you’ll often find her driving a 1957 Ford Step Van on the way to a party. 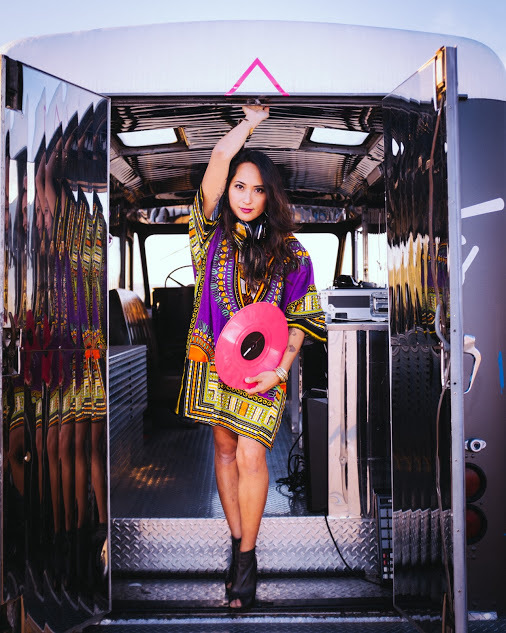 Marianne, AKA DJ Kiyomi, and her step van are usually the life of the party. In fact, she’s made a business of it. 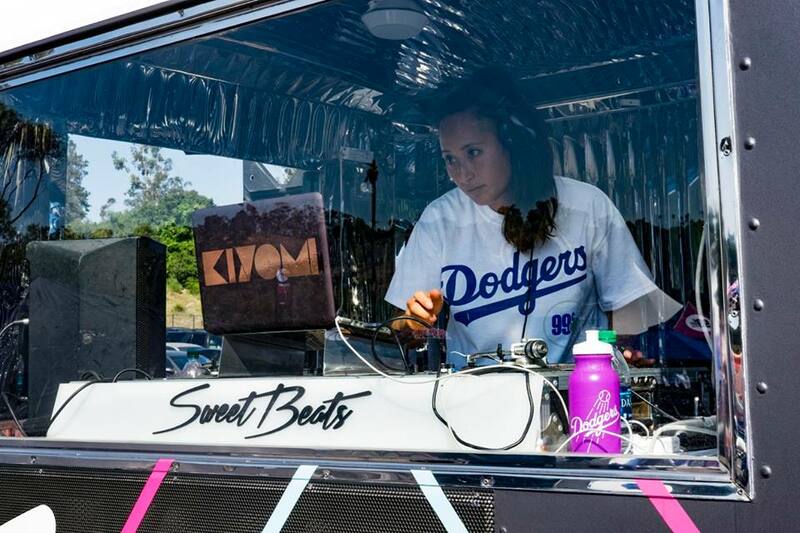 In a retrofitted 1957 Ford Step Van, DJ Kiyomi has made a business of bringing the party. 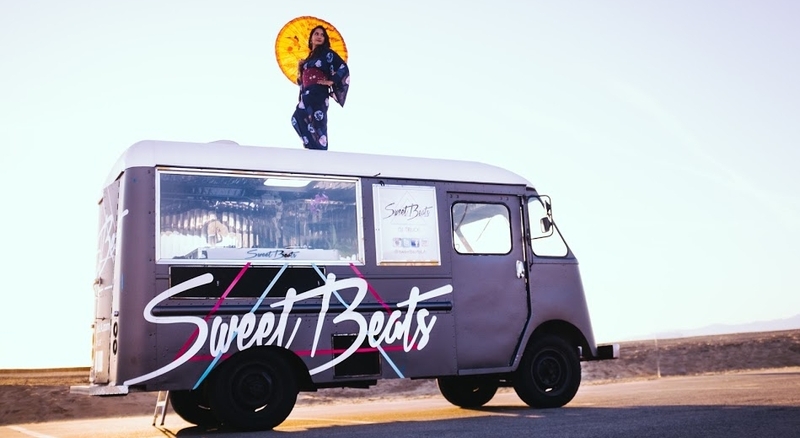 Sweet Beats LA is a DJ truck and mobile art installation hired out for parties, festivals and private events. Her favorite event so far: the pre-game party at Dodger Stadium where the truck sat on a custom built stage that overlooked a sea of people all dressed in blue and prepping for the big game. The truck’s meticulously smooth polished retrofitted steel interior supports a full DJ booth with high quality QSC speakers and subwoofer. The retro truck pays homage to the ice cream trucks of the past while playing the music of today. From inception to execution, Marianne’s business launched in one year. She dreamt the concept, bought the van and sought out private investors for the meticulous renovation. In 2011, it was rolling down the streets of Los Angeles. The initial business idea had the truck serving both music and ice cream, parked amongst food trucks and vendors. Immediately, the truck drew the crowds but the not the cash. 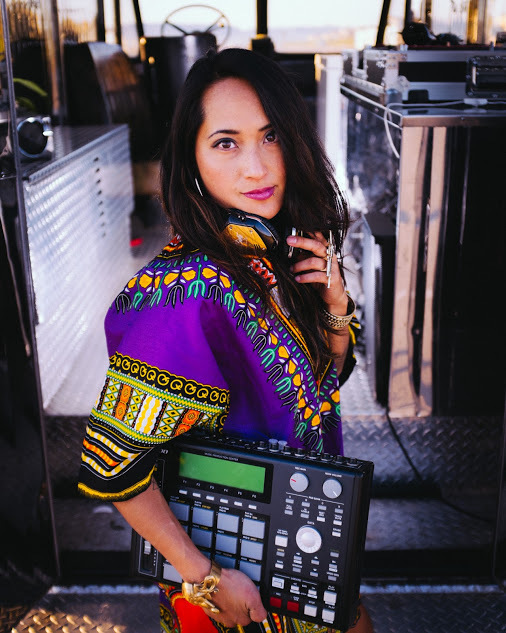 She quickly decided to opt out of serving ice cream, and in a quick savvy stroke, adjusted the business plan to accommodate a DJ truck primarily used for parties and events. It’s not uncommon to see Sweet Beats DJ’s, including Marianne, engulfed by a dancing crowd loving every moment. After a first handful of successful events, she realized she was on to a good business idea, and that it even had room to grow. Sweet Beats LA is now a multi-faceted business with many services. In addition to being a mobile party starter, Sweet Beats provides custom marketing campaigns and consumer engagement campaigns. In custom marketing campaigns, you can hire the truck for live musical performances, photo booths, celebrity DJ events, branded truck wraps, or simply hire the truck to keep the crowds circled around your professional or public engagement event. The truck has been used for everything from birthdays, weddings to corporate events. Marianne grew up in west LA, the second generation to immigrant parents from Japan and the Philippines. Influenced by the diversity of culture and music genres of a big city, Marianne’s musical education bubbled with richness and styles. 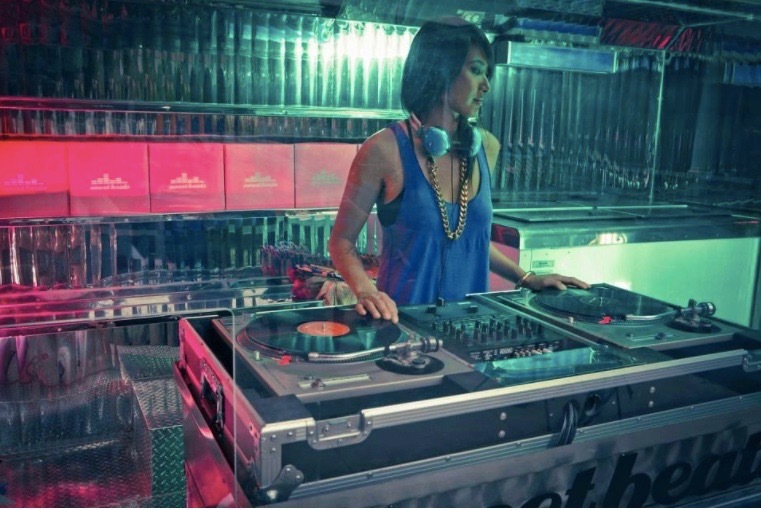 Today, in her sets as DJ Kiyomi, it’s not unlikely to hear brushes of Deep House, Hip Hop, R&B, old school, electronic and world music. The team behind Sweet Beats includes three other LA-based DJs: DJ Ry Toast, Carl AKA MudLux, and Josh Solis. The team is known for personality, to say the least. Youtube’s archives hosts a video of the team full clad in Halloween costumes, music playing as the roll down the streets, jumping out to hand out candy to fellow drivers at traffic lights. In an exclusive interview, we have the chance to learn more about the business venture, the future of Sweet Beats and how Marianne spends her time when she’s not starting the party. Is there a story behind the creation of Sweet Beats? Had you been thinking about it for a long time or was it a spontaneous creation? There’s definitely a story behind the creation of Sweet Beats. I got the idea of Sweet Beats in 2010. I was DJing for several years, but I was frustrated from DJing in the small bar scenes. I wanted to expand to something bigger. I wanted a way to play music for more people and just spread my love of music out into the city. That’s when the idea of an ice cream truck with a built in DJ booth came to me. The idea was planted in my head so vividly. I drew it out and then rendered it on Photoshop. I became so obsessed with the idea--I knew I had to create it. It took one year to plan it out and build, and then, in 2011, I launched Sweet Beats as LA’s first DJ ice cream truck. Why was it or wasn’t it a complicated business venture? It was a complicated business venture because I didn’t know any person who had done it before so I couldn’t get advice or model this after anyone. It really started out as 3 businesses in one: an ice cream truck, a DJ service, and a mobile t-shirt store. After years of running the business and through trial and error, the business evolved and I took out what wasn’t working. Selling ice cream was more difficult than I expected. We first started out rolling where the food trucks were. People loved us, but they would hang out by the truck listening to the music and not buy any ice cream. Some days, I would work 13 hour days and come home with only $30 in profit. In the end, it was really tough to let go of the ice cream aspect of Sweet Beats, but it allowed us to grow in other ways we never imagined. Now, we focus on playing good music for large audiences like at festivals and block parties. That’s something we couldn’t do while parked at sidewalks, limited by sound ordinances. Can you tell one short story that illustrates your upbringing and where you are from? I’m second generation to immigrant parents from Japan and the Philippines. I was born and raised on the westside of Los Angeles. On top of having a multicultural family, I also had influences from my diverse circles of friends. It’s a true example of growing up in the heart of LA, amidst a melting pot of cultures and communities. I think that’s what shaped my openness and creativity. For instance, with music, I got to be around many different scenes growing up in the 90’s. Some nights, I would go out to raves and dance to deep house music, and on other days, I would go hang out with friends and listen to hip-hop, R&B, and old school. I also had friends that got me into alternative, electronic, and world music. Because I’ve had these different influences, I’m grateful now to incorporate them into my sets and create unique musical experiences for people through the Sweet Beats truck. I would say my closest friends would describe me as creative, playful, and a problem solver. Most people don’t know that aside from DJing, I love painting. I love working with my hands, whether its spinning on turntables or dabbing some paint onto panels. I can get lost for hours in painting. Last year, I started painting portraits of my closest DJ friends. 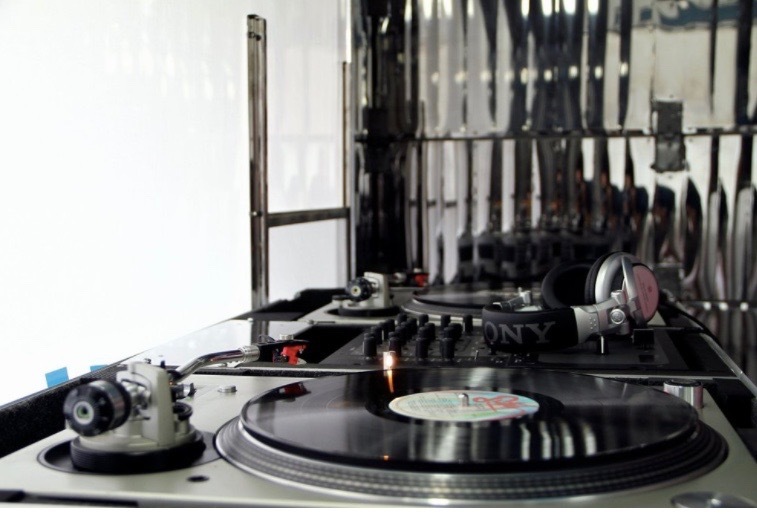 What are three key aspects of a good DJ set? There are different types of DJs, so it’s not easy to answer this question. I’ll answer the question based on a DJ you would hire for a general party. The first key to a good DJ set is the technical aspect. If it sounds like you have shoes knocking around in the dryer, it’s going to throw people’s rhythm off. The second thing would be the DJ’s connection to the crowd. If the DJ is reading the crowd well, they’ll play music that will have the crowd dancing and having fun. The last thing would be that the DJ has to be having fun while spinning. The crowd will definitely feel the DJ’s vibe. It’s a symbiotic experience. The crowd feeds off the DJ’s love for the music they are playing. If the DJ doesn’t seem like they are having fun and loving the music, the crowd won’t either. What song gets you fired up every time you hear it? Hmm . . . that’s a hard one! If I had to pick one though, I would have to say Eye of the Tiger by Survivor. Describe a typical (good) day for you? How do you spend your time? A typical good day for me would be starting my day off with meditation, drinking maté, and then meeting up with the Sweet Beats team to go over ideas, opportunities, and actions. At the end of the day, I would get some exercise or catch the sunset at the beach, cook a good meal, and then paint or go digging for music. If you could invite three known musicians to your dinner party (dead or alive), who would you invite? What does the Sweet Beats project look like in 3 years? 10 years? In 3 years, I would love for Sweets Beats to expand outside of Los Angeles and into other cities. One of the benefits of starting this company has been meeting and working with all these talented DJs who have a similar interest in spreading their love of music. I’ve had guest DJs on my truck, and that gave me the idea of expanding the business in a similar way. I thought...why not have more Sweet Beats trucks in other cities? Why not use this company as a platform to spread more joy and music in other cities? In 10 years, I would love Sweet Beats, the brand, to have a global impact on inspiring young people to be creative. I’m not sure what that looks like yet, but I know I would love to see more young people believing in their creative expression. It was a journey for me to unleash my creativity. It would have been amazing if I had more support around that or someone who could have mentored me in helping me to make my creative ideas into reality. Why did you want to start Sweet Beats and what is its premier objective? In the beginning, I started Sweet Beats as a way of being able to spread my love and joy of music to the city. While it’s been the primary objective so far, I’m now seeing that Sweet Beats serves as a creative inspiration to people. It’s pretty amazing to see how people get so excited and lit up when they see the truck for the first time. The conversations that start as a result are really amazing. People are more creative, imaginative, and interesting than you’d ever think. In thinking about how I’d like the truck and the brand to evolve, I’d also like our primary objective to evolve as well. Spreading the love and joy of music will always be something we do, but ultimately, serving as a creative inspiration will be what we will strive to carry out in every aspect of the brand. What has been the most memorable experience(s) with Sweet Beats so far? 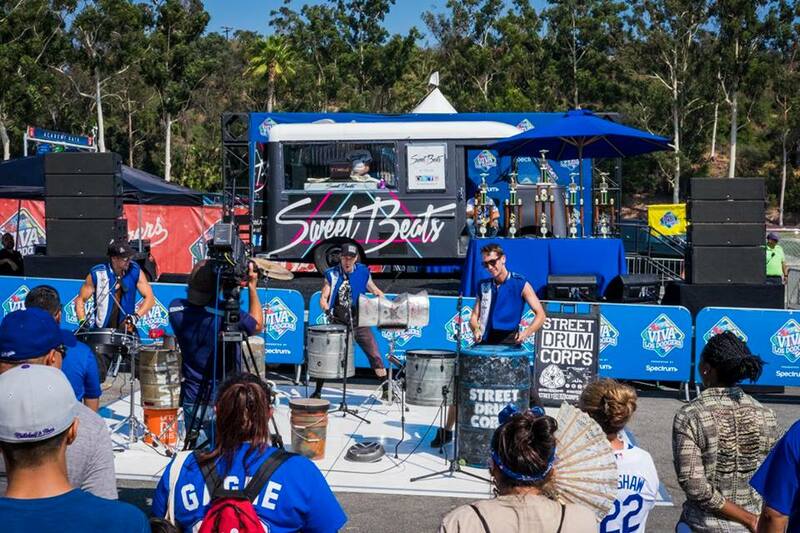 The most memorable experience with Sweet Beats so far has been playing at Dodger stadium for a pre-game event. They custom built a stage just for the truck that overlooked a sea of people who were all dressed in blue. We even got to meet Andre Ethier, the outfielder at the time. I was born and raised in Los Angeles, so I’ve been a Dodger fan since I was a little girl, so it was a dream come true for me.